‘A stitch in time saves nine’ or so my grandmother used to say. I’m not for one minute suggesting that we all get our sewing kits out because no one can be worse than me with a needle and thread! The world at large is a safer place if I’m not responsible for darning socks. I am suggesting though that a little bit of time and effort spent sorting your wardrobe now will save you lots of stress, time and money in the coming months. According to a survey by M&S, women spend on average 17 minutes per day choosing what to wear. One of the reasons given is that wardrobes are so full we cannot see what is in there. The good news is that this can be easily rectified and the change of season is a perfect time to do it. We wear our autumn wardrobes for at least 6 months of the year so I calculate we could each save 45 hours over the next few months – that’s more than the average working week! Anything that doesn’t fit or flatter your figure. Don’t hold on to items that are at a size you’d like to be. It’s far better to dress for the shape you are. Styles that still have the label on one year after buying. You clearly are not keen. Clothes you haven’t worn for two years – apart from sentimental pieces. You can hold onto your wedding dress, I’m not that mean! Styles you have in abundance. If you have 25 pairs of black trousers in your wardrobe work out the ones you love the best (3-5 pairs is plenty) and ditch the rest. When you have less in your wardrobe you can clearly see what is in there. You’ll be able to create more outfits and also spot any gaps so the next time you are shopping you can focus on these. Imagine stress free mornings choosing an outfit you feel great in in just a few minutes – it is possible! For all your hard work sorting your wardrobe you will deserve a treat. Might I suggest a new coat? Well, you need to look smart so you can go out and about with all your newly found free time. If you would haven’t got the time or inclination to sort out your wardrobe then I’d be happy to give you a helping hand. My Wardrobe Refresh service helps you declutter, edit and organise your wardrobe so you are left with a stylish selection of clothes that are right for you. Please get in touch by replying to this email. You can also find details of all my services on the website. 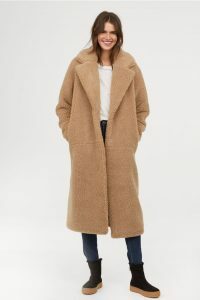 Shearling and mock shearling coats are all the rage. They work well in the caramel and biscuits shades that are on trend and they are fabulous for evenings out. 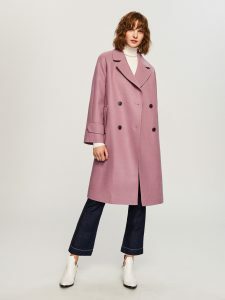 It was a tough choice to pick just one coat to represent a statement colour as there are so many stunning shades around this season. You can find every tone from red to browns and camel with lots of green in between. I picked this lovely lilac shade as it looks fresh and new. It also works really well with the burnt reds and maroons around for an interesting colour combination. You may need your check book to buy this but I couldn’t resist featuring it. I’m a big fan of black watch tartan as it looks smart and sophisticated. It’s a keeper and should be a wardrobe staple for at least 100 years so if we look at cost per wear it’s good value for money – right? !